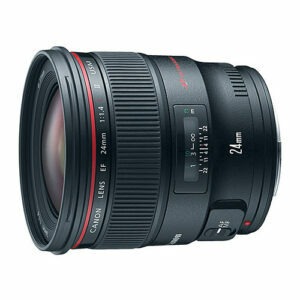 Lens Description: Canon\'s newest fixed length L-series lens, the EF 24mm f/1.4L II USM, incorporates the newest in Canon lens technology for spectacular sharpness and impressive performance at all settings. It features two high-precision, large-diameter aspherical lenses for sharpness across the sensor, even in peripheral areas of full-frame sensors. Lens elements have a newly-designed anti-reflective SWC (Sub Wavelength Coating) that departs from conventional coatings by using an extremely fine structure that minimizes ghosting and flaring across the lens surface, regardless of the angle with which light enters or exits. It also features two UD lens elements to minimize chromatic aberrations, incorporates rear-focusing, ultrasonic, quiet and high-speed AF with full-time manual override. A circular aperture provides beautiful out-of-focus detail and offers legendary dust- and water-resistant L-series construction using only lead-free glass.